To fully perceive the nuances of Navajo weavings has required thousands of antique Navajo textiles to pass through my hands over the last 25 years. Understanding the uniqueness of certain pieces came after careful examination and reflection allowed a perception of artistic individuality to solidify in my mind. I have heard it takes years to understand modern art; the same adage applies to Navajo weavings. I recognized a small subsection of textiles existed alongside the usual traditional patterns. The Navajo weavings I’m referring to each have a simple but sophisticated set of parameters, bold design sensibilities and unusual color combinations which give them the ability to stand apart in a sea of Navajo wool. 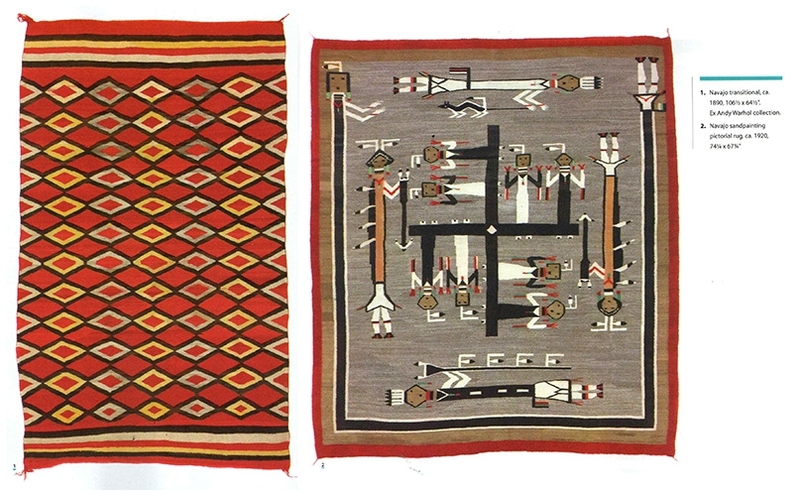 This set, unique in its artistic voice, could not be pigeonholed into the standard classification of weavings by region, color or trading post attribution. I call this group of textiles Navajo Modern Aesthetic. The Navajos who have been weaving for hundreds of years have been drawn to square and polygon structures often incorporating them into the designs of their textiles. Often these boxes are found within subtle gradients of color, the weaving palette implementing a sense of texture and subtle color change expressed through the carding of wool. Often the placement of boxes in Navajo weavings reflects religious significance as with the ”emergence hole.” The hole, usually designated by a small square, is the place the Diné believe they escaped from the third world into the present fourth world and the four sacred mountains that make up the world of Dinétah surround the entrance. It's the Diné artistic strength that sets these modern aesthetic weavings apart. Bold, simplistic renderings of color, form, and repetitive patterns engage the eye, similar to works by contemporary masters of the modern art world. 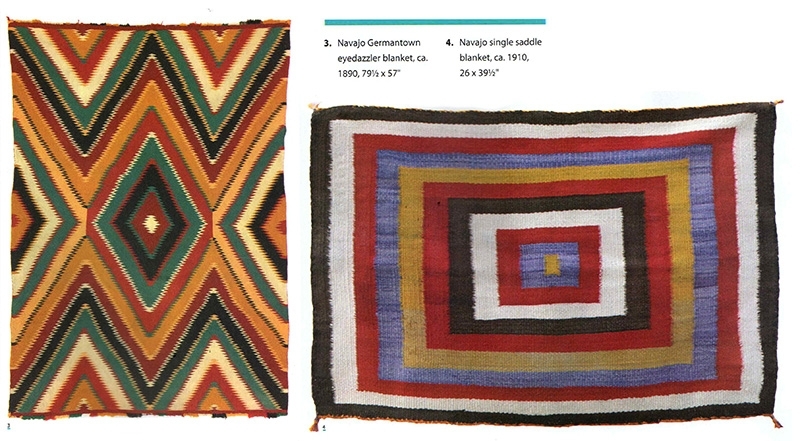 I find some of the most intriguing Navajo textiles gravitate around the transitional blanket and early rug time frame (1890-1920). This period of great change for the Diné, I hypothesize, was the impetus for self-expression and exploration. The traders, ingrained in the Navajo culture and their financial process by the 1880s, encouraged weavers to stop making blankets for self-use and trade and transition to creating rugs and designs for tourists and sale abroad. Some Indian traders like J.B. Moore at the Crystal trading post printed catalogs and sent mailers in 1903 to 1911 to Eastern tourists with patterns and colors one could order. Others, like Lorenzo Hubbell, encouraged the use of the color red and regional style, which became known as Ganado and Klagetoh designs. Toadlena, Two Grey Hills traders, encouraged the use of natural browns and whites with intricate designs, a weaving tradition that continues today at the Historic Toadlena Trading Post, which still produces some of the finest contemporary Navajo weavings ever made. Trying to understand what constituted a “rug” at the turn of the century allowed weavers to explore new ideas not bound by tradition or self-use, but out of imagination. The developing trading post styles led to an explosion of different types of weavings including multicolored zigzag designs most of which used the new colored commercial yarn made in Pennsylvania, known as Germantown yarn that was shipped to the trading post. Many of these "eyedazzlers” were the inspiration for collecting in the 1960s and '70s by contemporary artists, as the connection to eye dazzlers and the Op Art movement was evident to those in the modern art world. Saddle blankets that implored simple square designs of single color were made for more than just the back of a horse. They may also have had importance to the Medicine Man during ceremonial services. The blank center would allow the Medicine Man to avoid interference with his power while treating his patient who physically sat in the middle of his sand painting. A rug with motifs could affect the purity and power of sacred corn and pollen upon which they rest. Regardless of the intended use, the saddle blanket’s artistic strength of design stands out with the square format enhancing bold patterns. There is a certain energy felt from these dramatic works of art that are palpable. In 1950, Josef Albers began exploring what the Navajos had done a half-century before by using variations of blocks of color, while simultaneously, the abstract expressionist Mark Rothko was achieving recognition for his breakthrough use of simple block color to achieve a ”new” insight into another dimension of art. Rothko gave his paintings only numbers, not unlike the Navajo weavers who never titled a rug and rarely do so even today. Many other artists experimented with the concept of lines and blocks of color rendered in paint, sculpture and light. Early adapters include Frank Stella, Agnes Martin, Jorge Fick, Ad Reinhardt, Helen Frankenthaler, Donald Judd, Jasper Johns, Dan Flavin and Sam Francis. Many of the modern artists of the 1950s through the 19705 collected Navajo rugs or lived in the Southwest, including Agnes Martin, Georgia O'Keeffe, Jasper Johns, Donald Judd and Andy Warhol. The blanket, lot 2464 at the 1998 Sotheby’s Warhol sales, was one of many Navajo rugs owned by Warhol that sold not long after his death. Some modern artists used rugs in their paintings, like Phillip Pearlstein and Roy Lichtenstein. Judd’s studio and museum in Marfa, Texas, has many early Navajo rugs displayed and in use, just as they were when Judd was alive. Pollock, the most famous of the abstract expressionists, lived in Arizona during his younger years. He felt his drip paintings were similar in construction to the way Navajo sandpaintings were executed and often would sign his pieces with his hand print as seen in the early Anasazi wall paintings found at Cherry Creek, north of Globe, Arizona, an area which Pollock was known to have visited as a child in 1924. Woven sandpainting textiles are usually square in composition and incorporate religious figurative designs, which make them compelling works of both art and tradition. So what do modern art and Navajo weavings have to do with each other, besides being collected and admired by many of the king pin contemporary artists of the 20th century? I see a parallel path of exploration by Diné weavers of color and composition that predates the modernist movement. This modern aesthetic is especially noticeable in rugs that incorporate gradations of color in box motifs. Many of these textiles have similar sensibilities, especially to those of Rothko and Albers. Homage to the Square is one of the first exhibits that focuses on exploring Euclidean inspired Navajo weaving designs from the early twentieth century, juxtaposed against modern art from the 1950 through '70s that follows the same thread. There have been other exhibits looking at primitive and contemporary art. One of the earliest was the 1933 Durand-Ruel Gallery exhibition in New York of African Fang sculptures and contemporary paintings. In recent years Oceanic, Tribal, and African art have been used to start the dialog of their connection to modern art. A notable exhibit, Kindred Spirits, at the Peter Blum Gallery in New York City in 2011, explored a variety of Southwest Native arts and corresponding Modern art and produced a laudable accompanying catalog. Diné aesthetics, cultural morays, color sense, wool texture and simplistic bold composition allowed the Navajo weaver of the mid-19”‘ and early 20”‘ century to explore unrecognized creative possibilities and become the bedrock for modern artists that followed. Whether one can rationally make the leap that Navajo aesthetics inspired American modernists of the midcentury and beyond might be, for some, a large chasm to cross. It does, however, seem reasonable to postulate early Navajo weavers had to conquer similar obstacles as the modern artists of the twentieth century. Their mastery of color, composition, artistic and emotional introspection led to a unique form of expression not fully appreciated. One can hope Homage to the Square: Navajo Textiles as Modern Aesthetic opens the dialog for re-examining what defines modern art and exactly when did it take root in the American lexicon.